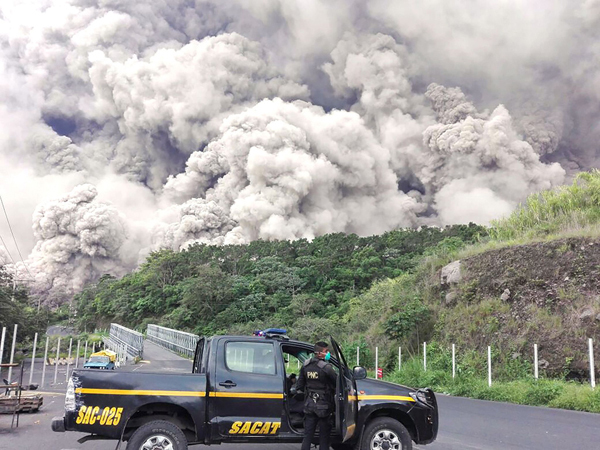 Rescue workers pulled at least 10 people alive from ash and mud flows around Guatemala's Volcan de Fuego on Monday. The country's national disaster agency reported at least 62 people have died since the volcano exploded Sunday. Officials say the number is expected to rise. Volcan de Fuego means Volcano of Fire in English. It is one of several active volcanoes in Guatemala. It sits 44 kilometers west of Guatemala City, the country's capital. The volcano sits close to Antigua, a former capital during Spanish colonial rule. The United Nations has recognized the town as a UNESCO world heritage site. Ash fell Sunday on Guatemala City as well as nearby areas. Streets and houses in Antigua were also covered. The explosion sent a huge cloud of ash several kilometers into the air. Extremely hot flows of ash mixed with water and debris, blocking some roads and burning homes. The land left behind was still too hot to touch or to recover bodies from many places. In some areas, rescue workers' shoes even melted. Hilda Lopez said the volcanic mud flowed into her village of San Miguel Los Lotes, close to the mountain. Lopez said she still does not know where her mother or sister are. "We were at a party, celebrating the birth of a baby, when one of the neighbors shouted at us to come out and see the that lava was coming," Lopez remembered. "We didn't believe it, and when we went out the hot mud was already coming down the street." "My mother was stuck there, she couldn't get out," said Lopez, crying and holding her face in her hands. In the village of El Rodeo, people said they did not learn of the danger until it was too late. Some were critical of government officials. Rafael Letran, who lives in El Rodeo, said the disaster agency "never told us to leave. When the lava was already here they passed by in their pickup trucks telling...us to leave, but the cars did not stop to pick people up." The disaster agency said more than 3,200 people had left affected areas. Volcan de Fuego is one of Central America's most active volcanoes. The very top of it reaches a height of 3,763 meters above sea level. The eruption on Sunday was the volcano's most powerful explosion in more than 40 years. Iceland is one of the few places on Earth where active volcanoes lie below icecaps. Do you realize how many pickup trucks there are on the road? 5.The land left behind was still too hot to touch or to recover bodies from many places. 6. "We were at a party, celebrating the birth of a baby, when one of the neighbors shouted at us to come out and see the that lava was coming," Lopez remembered. The book comes out this week. The truth is beginning to come out about what happened.